An important finding from studies in evolutionary psychology regards the instinct to avoid “contamination.” Humans avoid touching a object, and even more so, ingesting food, that is thought to be “contaminated” without regard to the ratio of “good” to “bad.” This might be considered a hard-wired version of a naive biology, which protects from dangerous pathogens in the form of replicating bacteria or parasites. The main difference between a threat of replicators as opposed to something toxic like a poisonous chemical, is that final population of replicators is not limited by their initial numbers. Rather, they will, as is their want, replicate until they reach some natural limit or resources, etc. That is why they are called “germs” (literally “seeds”). Like weeds, once one is in the garden, no part is safe. While the germ theory is disease is centuries old, more recent threats have been intensified in which the poisonous seeds are not alive in the conventionally sense. Mad Cow Disease, which is called Creutzfeldt–Jakob disease in humans, was so terrifying since it seemed to be contagious although no previously known pathogen could be identified as the cause. It turned out that a single misfolded protein called a prion was what was being passed in CJD. The misfolded protein served as a template that caused normal proteins to also misfold in the same way, creating a contagion no less real than one caused by multiplying bacteria. Kurt Vonnegut’s “Cat’s Cradle” explores a similar theme, in which the dangerous germ is a seed crystal for a more stable configuration of ice that would be solid at room temperature. If a crystal would come in contact with normal water, the whole thing would freeze solid, based on the action of the tiny seed. In real life, Tin pest is an autocatalytic form of tin that can lead to metal slowly turning to dust after being contaminated. An important new paper shows how another condition, Alzhimer’s disease, is the result of a misfolded protein that conscripts normal proteins into its deadly game. In this case, a single misfolded protein serves as a template that grows as new proteins are added, forming a fibril. The authors of the new study were able to show that even the sides of this fibril contribute to the “secondary nucleation” of additional fibrils. In this one, a single seed of malignant protein can wreak havoc. Insights like this are crucial to efforts to stem the tide of the disease. On the Skeptics Guide to the Universe, the hosts noted that the plural of “glass” is “glasses,” not to be confused with a term that refers exclusively to corrective lenses (or many sets of Google’s latest invention). The news story under discussion was a recent study on the physical properties of a 20 million year old piece of amber. The findings highlight the fact that, even given such a long time period, the amber, which is dried tree resin, hardly flowed at all. This shows the pitfalls in thinking about glasses as “frozen liquids,” as this can lead to some severe misconceptions. For example, as discussed in the same SGU segment, there used to be an urban legend that the “flow” of glass could be observed in the stained-glass windows of old cathedrals, which are supposedly thicker at the bottom than the top. However, this is due to the limitations of Medieval glass-making technology, which could only produce nonuniform slabs, which were logically installed with the thicker end down. (Another good example of accurate observation coupled with a totally off-base interpretation) Glass is a frozen liquid in the sense that if you could take a snapshot of its molecules, they are arranged in a disordered noncrystalline configuration, compared to the regular repeating lattice a solid. You can imagine taking a liquid and instantly freezing all of the molecules in place, and it would look like a glass. However, if you actually try to freeze an ordinary liquid by cooling it, the molecules will try to arrange themselves into their preferred lattice configuration and create a solid. This liquid-solid phase transition is essentially reversible and not path dependent. That is, the system always tries to minimize its free energy, which sets up an epic struggle between the chemical energy (which is minimized by the formation of many regular bonds), vs entropy, which wants to have as much freedom as possible. The key parameter, not surprisingly, is temperature, so there is a well-defined “melting point,” above which entropy wins (liquids are free to flow) and below which chemical energy wins (in a crystalline solid, there are many regular bonds). With glasses, the situation is much more complicated. 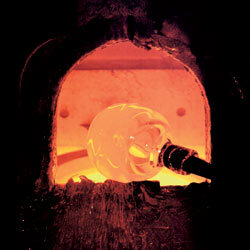 Instead of a melting point, there is a “glass transition temperature,” which changes the hard glass into a liquid. As the molten glass is cooled below the glass transition temperature, the molecules try to arrange themselves into a regular lattice, but they move slower and slower and never quite make it. They just get stuck, but the degree to which they remain disordered depends greatly on how quickly the glass was cooled. If it was cooled too fast, it might have to be annealed afterwards in a process that reheats the glass so that the molecules will have enough energy to escape local minima and find more stable configurations. A quick analogy might be the carpentry dictum “don’t tighten the screws too soon” you should keep in mind when assembling furniture from IKEA. You want to allow enough play for the pieces to shift slightly into the “right” positions, then progressively tighten the constraints so they remain there. While often conflated with the Theory of Evolution, the idea that all living organisms surviving to the present day are descended from a single common ancestor is a separate notion (although there is overwhelming evidence for both). Given the common characteristics of all known forms of life, especially the mechanism by which DNA is encoded and translated into proteins, it is very probably that a single instance of abiogenesis is responsible for all life, although we cannot rule out the possibility that other replicators – with a completely different genetic system – that we would still readily classify as “alive” existed at some time but died out. We tend to think that the development of “life” from “nonlife” would be so rare as to happen only once, but it may be that just one of several survived. In any case, the “frozen accident” of the existing DNA code created such a deep “local minimum” in the adaptation landscape that it was not possible for an organism to go back and change it, whether it is the best conceivable system or not. We can make some interesting suppositions about the lifestyle of the universal common ancestor based on characteristics common to all life. In a certain sense, multicellular organisms expend at lot of effort to RECREATE this environment. Our bodies are almost like reverse scuba suits (as in The Far Side cartoon, in which a fish could walk outside its bowl) providing a salty, aqueous mileu akin to the “warm little pond” that Darwin envisioned as the birthplace of life. The blood and intersititial fluid provide a high sodium, low potassium environment (compared to the interior of cells) that UCA would find comfortable. As discussed in The Spark of Life by Frances Ashcroft, these needs are so engrained in the way our cells function that they require special ion channels to keep the Na+ and K+ ions out and in, respectively, and many neurotoxins exploit this universal need as molecules that block or prop open the channel, with very deleterious effects. Thinking about all life as related causes some unsettling philosophical conclusions. For example, every act of predation is, in a sense, fratricidal. Perhaps an unconcious unease with thinking about Man and louse as being in any way comparable led to notions like spontaneous generation. The death of which was the slaying of a beautiful theory by an ugly fact according to Thomas Henry Huxley. In any case, by applying moden bioinfomatic methods to patterns in human DNA code allow us to recreate migration patterns, or establish that we are all part Neanderthal. The latter conclusion was apparently confirmed in the most direct way possible when the remains of the child of a such a union were discovered.